Over 30 participants took part in learning more about an elective course held for 15 weeks where seven university students studied Zoltán Dörnyei’s tripartite L2 motivational self-system. These learners explored what this self-system meant through readings, mini-lectures, and learner-led discussions. Successively, each learner drew a pictorial representation in poster form about their learning experiences, their ought-to self, and their ideal self, which comprised this tripartite model. 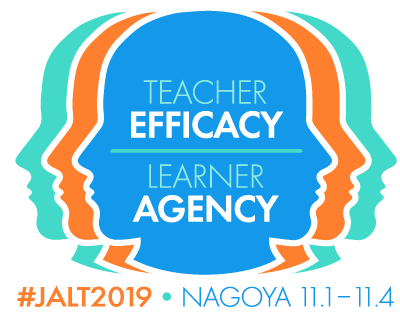 Moreover, participants asked many engaging questions, which sparked their creative process about how art and content can be adapted in their contexts. Is the title of the course L2 Motivation Self System? Could you explain a bit more about English for Specific Purposes (what is the specific purpose?)? Which of the readings do the students do (all the ones in your list?)? Do they read in class? At home? What do you actually do in the class? Maybe explain a bit more about note-taking – is this also a form of “art-work”, since it could be a more visual representation of text?? What’s the relation between note-taking and poster making and writing? You mention in the Course Goals that you establish connections with related topics – what do you mean here? Could you say a bit more about the academic paper they write? Does the poster support the writing in any way? What would you say students learn (are supposed to learn) most in this course? About themselves and their goals? About Dornyei’s Motivational Self Concept? About academic writing? All of these things? 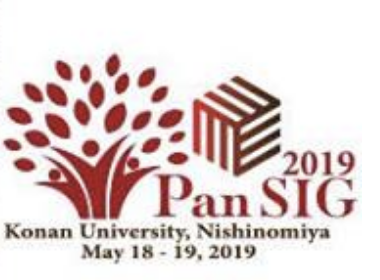 I’m looking forward to reading the write-up and am glad that other people will have the chance to enjoy your students’ posters. 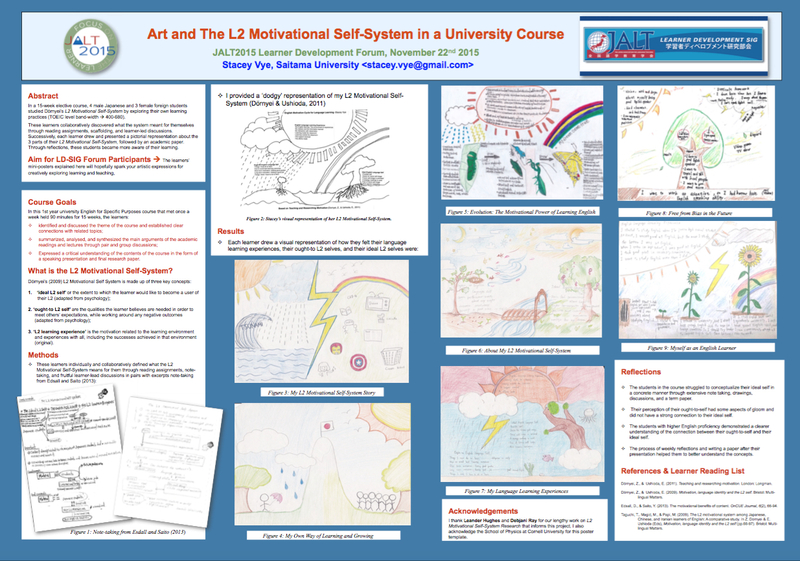 Many thanks for sharing your poster from the forum about ‘art and the L2 motivational self–system in a university course’. I wasn’t able to see your poster at the forum and I’m really glad to have the chance to look at it online. It’s beautifully designed. The drawings really catch the eye, and I enjoyed moving between the drawings and looking at the guideline notes on the poster. As I was looking, I began to make connections between different pictures visually – I couldn’t read what the students had written so it was interesting to look just at the visual dimension. Your own ‘dodgy’ representation (!) and Figure 5 seem to have a strong relationship; it’s interesting how the student has added colourful insects that are being nurtured by the elements. I thought that made for an intriguing contrast with the human and manufactured elements in Figure 3 and the inclusion of human figures in Figure 4. I wondered what the students would say about their own drawings and their own interpretations of them, and what stories of learning and development they might tell around their drawings. Presumably there are significant stories/experiences behind the choice and combinations of different visual elements. Did you get a sense that the students moved into ‘storying their experiences and interpretations’, or did they ‘focus more on analysis’, or did they ‘mix’ different ways of explaining their drawings? It’d be great to hear more from you about how your students talked about their drawings.